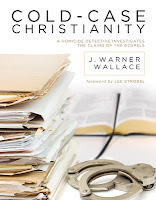 This is a collection of some of my favorite quotes from the book Cold Case Christianity by author J. Warner Wallace of ColdCaseChristianity.com. My review of the book may be found here. For more resources from Wallace and information about the book, check out ColdCaseChristianity.com. "In a culture where image is more important than information, style more important than substance it is not enough to possess the truth. Case makers must also master the media." "All of us ought to be willing to argue the merits of our case without resorting to tactics unbecoming of our worldviews." "While we are often willing to spend time reading the Bible, praying, or participating in church programs and services, few of us recognize the importance of becoming good Christian case makers." "We need to master the facts and evidences that support the claims of Christianity and anticipate the tactics of those who oppose us. This kind of preparation is a form of worship. When we devote ourselves to this rational preparation and study, we are worshiping God with our mind, the very thing He has called us to do (Matt. 22:37)." "I try not to bite on any particular philosophy or theory until one emerges as the most rational, given the evidence...There's one thing I know for sure (having worked both fresh and cold homicides): you simply cannot enter into an investigation with a philosophy that dictates the outcome...our presuppositions are sometimes hidden in a way that makes them hard to uncover and recognize." "The question is not whether or not we have ideas, opinions, or preexisting points of view; the question is whether or not we will allow these perspectives to prevent us from examining the evidence objectively. It's possible to have a prior opinion yet leave this presupposition at the door in order to examine the evidence fairly." "If skeptics were willing to give the Gospels the same 'benefit of the doubt' they are willing to give other ancient documents, the Gospels would easily pass the test of authorship." "If we are going to claim that the ancient stories are biased (because they were written by Christians), we cannot reject them with a bias of our own (against supernaturalism)." "The traditional definition of biblical inerrancy maintains that the Bible is accurate and completely free of error. Inerrancy does not require, however, that the biblical texts be free of any personal perspective or idiosyncrasies. In fact the existence of these distinctive features only helps us recognize the accounts as true eye-witness statements written by real people who revealed their human gifts (and limitations) along the way. These characteristics can help us have confidence in both the accuracy and the reliability of the accounts." "If evil were a matter of opinion, we could eliminate it by simply changing our minds." If you are ever in a discussion with a conservative Christian apologist regarding the veracity of Christianity, he or she will frequently recommend a list of Christian books for you to read. Almost invariably, one of those books will be Cold Case Christianity by J. Warner Wallace. Gary, thank you for your comment. If you are familiar with Wallace's history, you will know that he investigated the gospels while he was still an atheist. It was his expertise in eye-witness testimony that gave him the tools to properly analyze them. He concluded from his investigation that they are reliable testimonies of what happened. It was only after his investigation that he converted to Christian and explains how he came to his conclusion to other Christians and non-Christians. Wallace's conversion came after his investigation not before, so it is false to claim that he first became a Christian then started trying to build the case for his worldview. His assumption of the gospels' reliability is not a priori (prior to the evidence), as you claim; rather it is a posteriori (after the evidence).